O.J. Simpson during a break in a court hearing in Las Vegas in 2013. Simpson is up for parole after nearly nine years in prison on charges stemming from a bid to retrieve sports memorabilia. O.J. Simpson will find out on Thursday if he soon will be released from the Lovelock Correctional Center in Nevada. He has been held there for nearly nine years for convictions on armed robbery and other charges. The former NFL hero, TV pitchman and movie star, now 70, stands a good chance of being granted parole when he appears before the Nevada Parole Board via video link. No one has registered to testify against him. He will likely try to persuade the board of his good behavior behind bars. If paroled, Simpson would be released from prison no sooner than Oct. 1. As with all things O.J., there has been a tremendous media interest in the parole hearing. Thirty media organizations will be on-site in Carson City and at Lovelock Correctional Center, and many outlets will be streaming it live. Ordinarily, the parole board's decision would be announced a few weeks after the hearing. But the board announced that it will rule in Simpson's case the same day as the hearing, saying that it has been a "disruption" and the board wants to "return to normal as soon as possible after the hearing." It's not the way many Americans imagined he'd do time. The fame and adulation he once enjoyed are hard to overestimate. But it's also hard to overestimate how shocked his fans were when he was arrested in 1994 in the brutal slayings of his ex-wife, Nicole Brown Simpson, and her friend Ronald Goldman. He was acquitted of the murder charges in what became known as "the trial of the century." But years later, he couldn't beat the more mundane criminal charges stemming from a burglary gone wrong. In 1995, when Simpson was acquitted in the brutal stabbing deaths of his ex-wife and her friend, opinions on the verdict broke down largely along racial lines. Many African-Americans believed that the verdict was fair, but most whites thought he'd gotten away with murder. Two award-winning 2016 television productions provided reminders of how shocking the murder charges, trial and verdict were at the time: ESPN's documentary O.J. : Made in America and FX's The People v. O.J. Simpson. Simpson had been a Heisman Trophy winner while playing football in college. He made the NFL Hall of Fame. After retiring from sports, he became a commentator and actor. He starred in commercials for Hertz Rental Cars that showed him hurdling obstacles in an airport the way he once hurdled defensive linemen. He proved himself a decent comic foil in the popular Naked Gun movies. He was glamorous and rich. But after all his glory and his infamy, he was convicted of a botched 2007 burglary in a cheap Las Vegas hotel. Along with a handful of accomplices, the former star broke into the room of a couple of sports memorabilia dealers. They had some items that Simpson believed belonged to him and that he wanted back. A couple of guys with Simpson brought guns. Simpson was later convicted on 12 criminal counts including armed robbery, kidnapping and assault with a deadly weapon. He was sentenced to nine to 33 years. In his 2013 parole hearing, Simpson told the Nevada Parole Board that he wished he'd never gone into the hotel room. "I wish I'd said, 'Keep it and not worry about it,' " Simpson said. He also argued to the parole board that he'd been a model prisoner. When he'd arrived at Lovelock, "I gave [prison officials] my word that I would try to be, or would be, the best prisoner they ever had here. And I think for the most part, I've kept my word on that." He spoke via video conference from prison, while the parole board met in Carson City more than 100 miles away. That same procedure will be followed Thursday. In making parole decisions, the state of Nevada uses a scoring system to evaluate the risk a prisoner might pose to the community. The categories include an inmate's behavior in prison, as well as age. "He deserves parole. It's as simple as that," says Yale Galanter, one of Simpson's defense attorneys in the armed robbery case. Galanter believes that the Las Vegas jury was dishing out some payback, not so much for Simpson's murder acquittal 13 years earlier, but for a 2007 book that Simpson co-authored called, If I Did It. Galanter says he could hear the jury's anger over the book when he questioned them. And he didn't blame them. "How do you write a book that your children are going to see called 'If I killed your mother?' and 'If I killed your mother's friend?' I thought that was a totally, socially disgusting act." In 1997, two years after his acquittal, Simpson was found liable for the deaths of Brown and Goldman in a civil suit brought by their families. He was ordered to give control of the book to the Goldman family as partial payment of the civil judgment, and they changed the name to If I Did It: Confessions of the Killer. Some other news - O.J. Simpson finds out today if he will be released soon from a Nevada prison. He's been in there almost nine years. Nine was the minimum. He received a sentence of 9 to 33 years for armed robbery and other charges. NPR's Ina Jaffe has a preview of today's parole hearing. INA JAFFE, BYLINE: After all of O.J. Simpson's fame and notoriety, what landed him in a Nevada state prison was a robbery gone wrong. In 2007, Simpson and a few accomplices broke into the Las Vegas hotel room of a couple of sports memorabilia dealers. Simpson wanted to recover some stuff he said belonged to him. A couple of the guys with him brought guns. Eventually, Simpson was charged with 12 criminal counts, including armed robbery, kidnapping and assault with a deadly weapon. O J SIMPSON: I just wish I had never gone into that room, I wish I didn't. I wish I would have just said, keep it, and not worry about it. JAFFE: Simpson speaking at a hearing in 2013, when he was granted parole on some of the charges against him. He spoke to the parole board via video conference from the Lovelock Correctional Center. He'll do the same at today's hearing. Last time, he reminded the board about his exemplary behavior behind bars. SIMPSON: I gave them my word that I would try to be or would be the best person that they've ever had here. And I think, for the most part, I've kept my word on that. JAFFE: Simpson has a good chance to be paroled on the remaining charges after today's hearing. No one is scheduled to speak against him. The state of Nevada uses a scoring system to evaluate the risk a prisoner might pose to the community. Categories include behavior in prison and age. Simpson is 70. YALE GALANTER: He deserves parole, just simple as that. JAFFE: That's Yale Galanter, one of Simpson's defense attorneys in the armed robbery case. 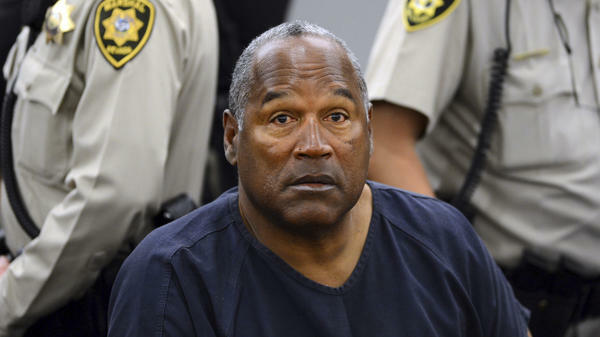 He thinks a Las Vegas jury was dishing out some payback, not so much for Simpson's acquittal 13 years earlier in the murders of his ex-wife, Nicole Brown Simpson, and her friend, Ronald Goldman, but for the recently published book that Simpson co-authored called "If I Did It." Galanter says he could hear the jury's disgust when he questioned them. GALANTER: How do write a book that your children are going to see called "If I Killed Your Mother" and "If I Killed Your Mother's Friends"? JAFFE: As with all things O.J., there's been tremendous media interest in this hearing. Ordinarily, the parole board's decision would follow in a few weeks, but they've announced that they will rule in Simpson's case today so they can put this behind them and get back to their normal way of doing business. Ina Jaffe, NPR News. (SOUNDBITE OF BONES DOMINGO'S "HAVE THIS") Transcript provided by NPR, Copyright NPR.